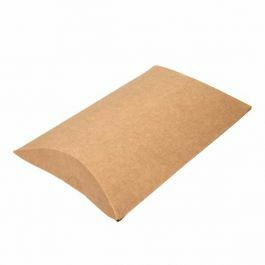 Kraft Pillow Boxes make unique wedding and party favors. 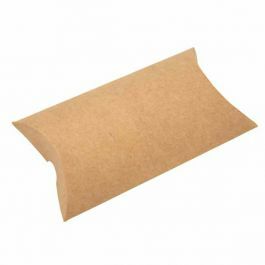 Our KPB75 Kraft Pillow Box is eco-friendly and made with recycled material. It measures 2" x 3/4" x 3" and has a usable space of 2 1/4" (middle length). Works well for holding sample packs of vitamins and supplements. Stickers are included, to purchase additional stickers click here to see our full list of sticker options. Kraft Pillow Boxes hold delightful surprises. Our KPB75 makes an excellent package for sample packs of vitamins/supplements, wedding favors, keepsake items, soaps and more. 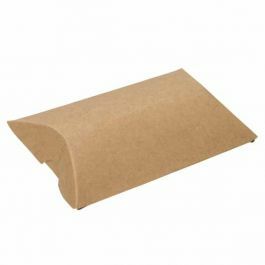 Our KPB75 Kraft Pillow Box measures 2" x 3/4" x 3" and has a usable space of 2 1/4" (middle length). 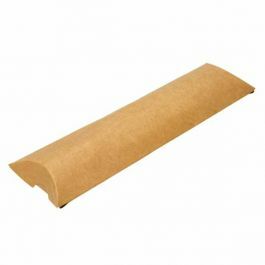 This is a great eco-friendly option and is made with 230 gsm Kraft board paper. Make this package even more unique with ties, stickers or a personalized rubber stamp. Fold in tabs to assemble. Box may be sealed securely with clear round stickers (included with product) or stretch loops. Outer Dimensions: 2" x 3/4" x 3"
Most popular use is for gifts and retail packaging. See the complete line of Kraft Pillow Boxes.